The Yangchuntang handbook bears no date at all; still it is possible to fix approximately when it was published. This handbook was compiled by Zhang Daming, a well-known qin master of the Ming period who lived in Fujian province. His first great work on the qin was the Qin Jing, a work on the qin in general, without tunes in notation; it was published in 1609. 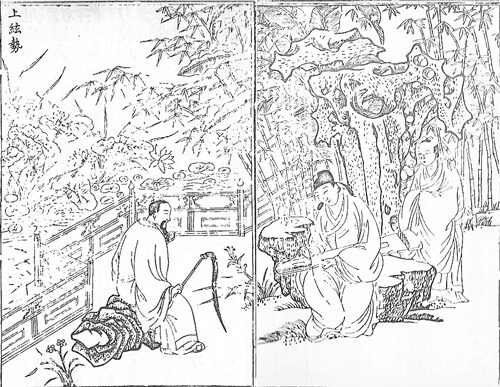 Now, in his preface to the Yangchun Tang handbook, Zhang Daming states that after having published a work of a more general nature like the Qin Jing, he felt it necessary to supplement this with a handbook containing tunes in notation: 'The qin needs a handbook with tunes in notation just as a cart needs its two thills....' Further, the famous scholar and calligrapher Dong Qichang (1555-1636) added an undated preface to (Yangchuntang Qinpu). In this preface he says that he met Zhang Daming in Fujian when traveling there on official business. Now it appears from Dong Qichang's biography that he visited South China in official capacity in the year 1622: 'He was ordered to proceed to the south to collect documents and other historical materials relating to the former dynasty.' Therefore we shall not be very wrong when we place the date of the Yangchuntang Qinpu somewhere around 1625...."
The Dong Qichang preface is not in the QQJC edition of Yangchuntang Qinpu, and so I can not follow the logic of Van Gulik's argument regarding dating this handbook. Also reprinted 1669 as 太古正音琴譜 Taigu Zhengyin Qinpu. This latter title is the one Zha Fuxi uses in his Guide, though he dates it to 1611; see in particular item 28 on p.15 and on p.66. This seems to suggest that the two editions are the same. However, Zha's preface in Qinqu Jicheng VII/ii-iii seems to say there are quite a few differences between the two editions. The commentary in Qinshu Cunmu (#196) also mentions 周東岡 Zhou Donggang! There is a continuation with an afterword by 楊容光 Yang Rongguang dated 1611 (VII/473), so this is the suggested date for the whole tablature collection. See, however, the comments by Van Gulik. 42673.155 陽春堂 says of Yangchun Tang, 明，張鳳翼之室名 the name of a hall belonging to Zhang Fengyi (10026.1261 Ming dynasty; no apparent relation). This image, copied from QQJC VII/348-9, is called 上絃勢 How to put on strings. Notice (enlarge) that the facing plates do not quite match. The suggestion that the person depicted on the left panel is Zhang Daming himself is based on other images on the following pages of the handbook. The handbook also has images showing finger techniques and imaginative shapes of ancient instrumets; similar images can be found in a number of early qin handbooks, beginning with Taiyin Daquanji, thought to date from the Song dynasty. 14 folios; essays, no melodies other than the warmup piece Caoman Yin; it was also compiled by 張大命 Zhang Daming of Fujian; prefaces by Zhang and 劉大任 Liu Daren; afterword by 陳五昌 Chen Wuchang. The copy in Qinqu Jicheng seems to be from the 1669 reprint by 沈國裕 Shen Guoyu, called 太古正音琴經 Taigu Zhengyin Qinjing. 'Classical Book of the Qin, in 14 chs., by the qin master Zhang Daming, called Yougun. First preface by the Ming scholar 葉向高 Ye Xianggao (cf. Ming Shi, ch.240), dated 1609; second preface by 劉大任 Liu Daren; author's preface dated 1609. Undated colophon by 陳五昌 Chen Wuchang. The original, finely executed Ming edition of this valuable book is extremely rare; but occasionally Chinese or Japanese manuscript copies may be found. About Zhang Daming, who later also published a collection of tunes in notation, the Yangchuntang Qinpu, little is known except that he was a man from Fujian. The Qin Jing is remarkable in that it does not contain a single qin tune in notation. The work is concerned with musical theory, rules for the qin player, how to read the qinpu, notes on famous old tunes and instruments, hints for appraising antique qins, how to build qins, how to select the correct surroundings for playing the qin, and finally an extensive collection of quotations from older literature. It is not clear whether Van Gulik's copy differs at all from the one included in Qinqu Jicheng. "Qimeng" literally means "reveal the hidden". See QQJC VII/445-72. See in the Table of Contents: there is tablature for Zhao Jun Yuan but apparently there should also be some for a Chibi Fu. See Lore, p. 121/2; his comments on Yangchuntang Qin Jing are above.